Russians would like to see Father Frost or a bear and tiger cubs as the mascot for the 2014 Winter Olympics in Sochi. ­The All-Russia Public Opinion Research Center conducted a poll on the issue in 46 regions of the country on November 13–14. The bear cub, who looks like an offspring of “Misha” – the mascot of the 1980 Moscow Games, tops the list with 17 per cent. He is followed by a duo of tiger cubs and a lone hare – both tied for second place with 14 per cent. Father Frost (the Russian Santa Claus) won 13 per cent, coming third. According to the opinion poll, the Olympic mascot has to be easy to understand and hard to forget (39 per cent) and, at the same time, reflect the cultural characteristics of the host country (35 per cent). But there is one creature, which does not seem to fit the criteria as 36 per cent of respondents confessed “there’s no way they’ll ever vote for” a frog, named “Zoich”. They disagree with the creator of the sketch, who believes that the creature – which has spinning multi-colored Olympic rings instead of eyeballs and has its head covered with the imperial crown – resembles Russian statehood and spirituality. 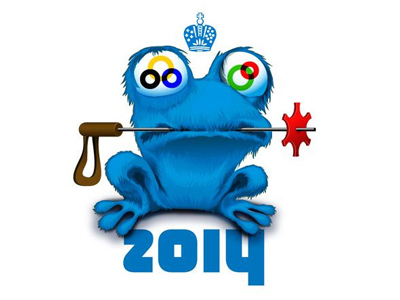 The name “Zoich” comes from the way internet pranksters read the number “2014” on the Sochi Games logo. The submission of sketches for the future mascot finishes in December. A panel of experts will then form a shortlist of finalists, with the winner to be decided by nationwide vote during a TV show on one of the country’s leading channels, scheduled for February 7, 2011.